As you travel through you journey, you will encounter Hau on a number of occasions. Not only is he your primary Rival, he will also become on of your best friends and allies during your adventure. Some of the times you run into him will only see him merely talking to you or giving you some type of item, and at other times he will be looking for a battle. Encounter 1 - Route 1: The first time you will encounter Hau is on Route 1 after choosing your Starter Pokemon. He will immediately challenge you to battle with his Starter Pokemon, which will always be the Starter that is weak to your Starter Pokemon. Encounter 2 - Iki Town: The day after choosing your Starter Pokemon at the Iki Town Festival, you will battle Hau once again. He will have added a Pichu to his party since the previous day. Encounter 3 - Pokemon Lab / Hau'oli City: The following day after the Iki Town Festival, you will meet Hau again when you go to the Professor's Lab to receive your Pokedex. 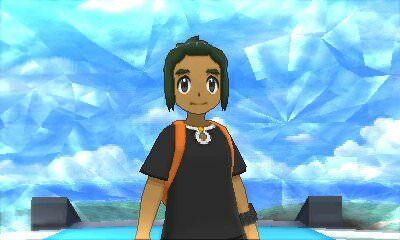 He will then travel with you and Lillie throughout Hau'oli City. Encounter 4 - Route 2: The next time you see Hau is for a short chat on Route 2. He will give you a few Revives and show you where the next Pokemon Center is. Encounter 5 - Route 3: After finding Lillie and helping her in Melemele Meadow, you will be challenged by Hau on Route 3. After defeating him, he will watch you battle Hala in your Melemele Island Grand Trial. Enccounter 6 - Big Wave Beach: After defeating your first Grand Trial, you and Hau will head to Big Wave Beach before using Mantine to surf to Akala Island together. Encounter 7 - Paniola Town: Right as you reach Paniola Town, Hau will appear and challenge you to another battle. Encounter 8 - Route 5: The next time you see Hau is when you'll first meet Gladion. Gladion has just defeat Hau in a battle, and now wants to challenge you. Encounter 9 - Royal Avenue: Once you arrive at Royal Avenue and are to participate in a Battle Royal, Hau will also participate in it with you. Encounter 10 - Diglett Tunnel: As you travel through Diglett Tunnel to reach Konikoni City, you will run into Team Skull and the Aether Foundation. The Aether Foundation will warn you about Team Skull, and you will end up facing two Team Skull Grunts with Hau. Encounter 11 - Ruins of Life & Aether Paradise: After defeating Kahuna Olivia in your Akala Island Grand Trial, Hau will come to challenge her next. As he does this, you will be asked to meet Faba of the Aether Foundation at the Hano Grand Resort. After chatting with Faba, he will end up taking both you and Hau with him to Aether Paradise. You and Hau will encounter an Ultra Beast there, one will end up needing to defeat in battle. Encounter 12 - Malie City: After defeating the Ultra Beast at Aether Paradise, you will be given a ride over to Ula'ula Island. Right after arriving, Hau will challenge you to another battle. Encounter 13 - Route 13: You will next see Hau on Route 13, where he will say hello and give you some Max Potions. Gladion will then show up and question the two of you about Cosmog, and Hau will let it slip that you two know something about it. Gladion will then tell the two of you to protect Cosmog from Team Skull at all cost. Encounter 14 - Tapu Village: Directly after seeing him on Route 13, you will meet Hau again in Tapu Village. After you do, the Ultra Recon Squad will appear and inform the two of you about their history with Necrozma. Encounter 15 - Aether House: As you first arrive at Aether House, Hau will appear and the two of you will have to battle some preschoolers. Encounter 16 - Aether House: After completing Acerola's Trial and you return to the Aether House, you will find Team Skull there after having stolen a Yungoos. Hau and Acerola will help you defeat Team Skull. After doing so, you will have to head to Po Town alone to find the Yungoos. Hau will remain at Aether house while you go to Po Town. Encounter 17 - Aether Paradise: After defeating Team Skull in Po Town and rescuing Yungoos, you will return to Aether House to find that Lillie has been taken by Team Skull. Hau will join you and Gladion to go to Aether Paradise, in hopes of finding Lillie there. In Aether Paradise, you will be challenge by a number of Aether Employees, some alone and some with Hau. After defeating the magnitude of employees standing in your way, you will finally reach the end of the Aether Paradise where you know Lillie will be. After the events unfold that sees Lusamine and Guzma heading into the Ultra Space to defeat Necrozma, Hau will pledge to get stronger. The two of you go separate ways for now, as he is set on finishing his Island Challenge. Encounter 18 - Mahalo Trail: Hau is next seen (not encountered) when Necrozma opens up a number of Wormholes, ones that transport Ultra Beasts to The Alola Region. Hau is set to battle one as Tapu Koko appears in order to help. Encounter 19 - Hau'oli Cemetery & Aether House: After defeating Necrozma, you will next see Hau during Captain Mina's Trial in both Hau'oli Cemetery and the Aether House. In both interactions with him, Hau will pledge to continue to get stronger in order to go toe to toe with you. Encounter 20 - Pokemon League: The next time you see Hau will be at the Pokemon League. The two of you will battle to become the first ever Alola Region Champion. Encounter 21 - Route 1 & Poni Grove: After becoming the first ever Alola Region Champion, Hau will come to your house and then the two of you will help the Ultra Recon Squad capture Ultra Beasts found in Poni Grove. Encounter 22 - Pokemon League Rematch: Whenver you rematch the Pokemon League, there is always the chance of being challenged by Hau for the championship.